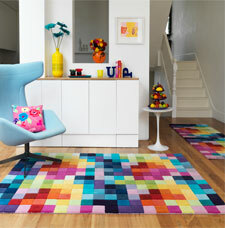 Funk is a range of handmade wool rugs in fashionable colours. Each rug features a multi-coloured geometric design laid out on a thick and dense wool pile. In addition, each rug is hand-carved across the length and width, which makes each pattern more prominent and augments the colours. Funk is a great range of modern wool rugs that are very soft to the touch.